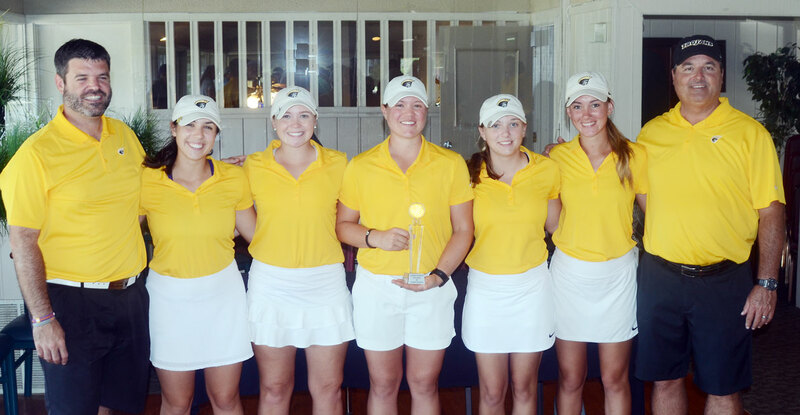 The Anderson women’s team won the Anderson Invitational for the first time. Team members included Coaches Danny Neal and Denton Moore, Kate Hill, Tiffany Elam, Anna Freeman, Riley Lovorn and Makalyn Poole. 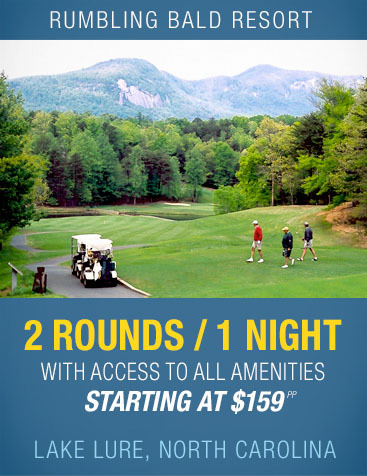 The Anderson women’s team has come close to victory in the tournament they have hosted at Cobb’s Glen several times over the past few years. This year led by a runner-up finish from sophomore Kate Hill the Trojans topped the field for their first win in their own tournament. “As a team to get one done on our home course we feel really good about that and hopefully we can use it as momentum going forward for the season,” said Anderson coach Danny Neal. 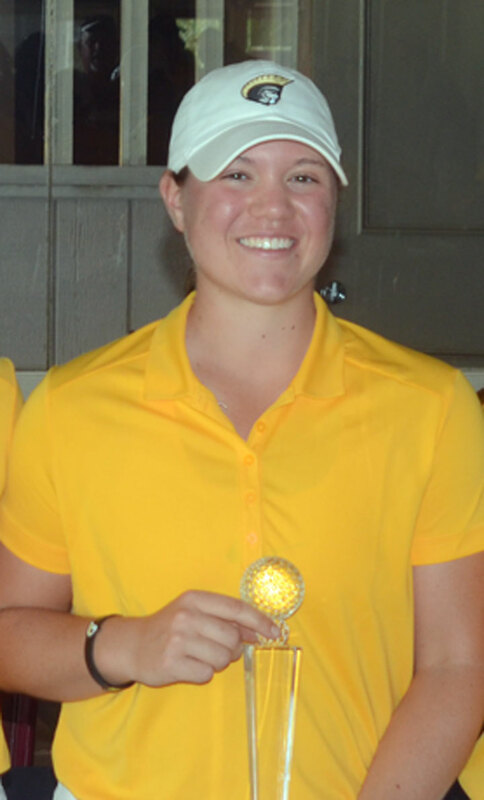 The best finish in the tournament for the Trojans was second place in 2015 when Makalyn Poole claimed the individual title. Kate Hill led the Trojan’s to the championship with her second place individual finish. This year Hill came within a shot of tying for medalist honors with Dominika Czudkove of Lincoln Memorial who claimed the individual title. “Kate has been rock solid last year since she joined us last year. She was the freshman of the year in the conference and we are looking to buid on that and keep leading us as we go forward,” said the coach. Five Anderson golfers finished in the top ten with Tiffany Elam joining Hill on the All-Tournament team. Elam finished in a tie for fifth place while Anna Freeman tied teammate Riley Lovorn for seventh place. Samantha Ellison playing as an individual entrant finished in 10th place. “I think our team is a little deeper and steadier this year and I’m looking forward to see how we do all year. The scores were not as good as we have done in some qualifying rounds, but the course was difficult and the rough was up so I think we did well,” said Neal. Craig Stephen of Brevard was the only golfer to shoot an under-par round and was the men’s medalist. 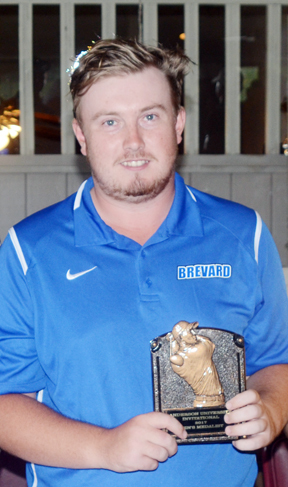 In the men’s portion of the tournament Craig Stephen of Brevard turned in the only under-par round of the tournament. 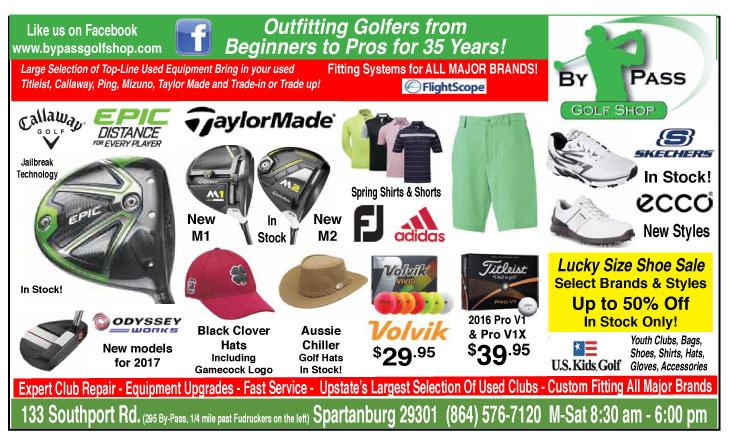 The senior from Scotland shot a 2-under par 70 in the final round to win his first college tournament. 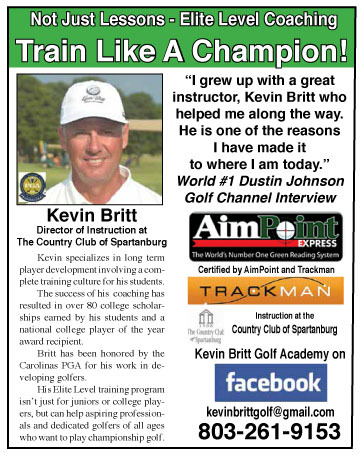 “I had great help from my coach all around the course,” said the winner. “Paul Calac was with me on every shot and we made a good team,” said Stephen. Stephen started the final round three shots off the pace, but his two day total of 146 gave him a four shot victory at the Anderson tournament. “I made a few more putts today and I had two eagles and that helped,” he said. The team from George Southwestern won the team title by one shot over Anderson. The Trojans Forrest Fowler made the All-Tournament team and tied Drew Buffaloe of Bob Jones University for second place. Georgia Southwestern won the Anderson Invitational team title by one shot over the home team Trojans.